As the demand for security systems offering added value such as automation and smart control increase, so wireless connectivity is becoming an important part of intruder alarm system design. Because of the critical nature of intruder detection systems, however, it’s vital that wireless connectivity is robust and secure. Any system which does not have resilience and redundancy will always be prone to failure, as will any that cannot automatically adjust to ensure that there are always usable signalling routes. Issues with range also need to be addressed, and the security installer should be able to verify the state of the wireless connectivity at any time. Texecom’s Ricochet-enabled wireless devices receive and repeat wireless transmissions from other devices, with the size, scalability and range of the entire system extended as wireless signalling is no longer limited by point-to-point communications. With Ricochet, all field devices can communicate with each other as well as the control panel. Should wireless connection between two devices weaken, the network will ‘self-heal’ and automatically re-route communications via alternate Ricochet-enabled devices. This delivers the flexibility to reroute signals via other devices to ensure it will arrive at the control panel. This is very different to the point-to-point topology of traditional wireless systems, which by its very nature introduces many points of failure. Given the continual monitoring, intelligent self-healing, redundancy and the elimination of range issues, mesh-based technology is the only wireless connectivity solution in the security industry that can claim to be secure. Ricochet delivers real-world benefits for intruder detection. It not only makes the security system more robust and reliable – even in situations which are typically challenging for wireless performance – it also allows a more flexible design than with less advanced wireless systems. By applying a mesh topology to intruder alarm system design, it allows credible wireless protection to be deployed in places where traditional radio-based systems simply will not work. 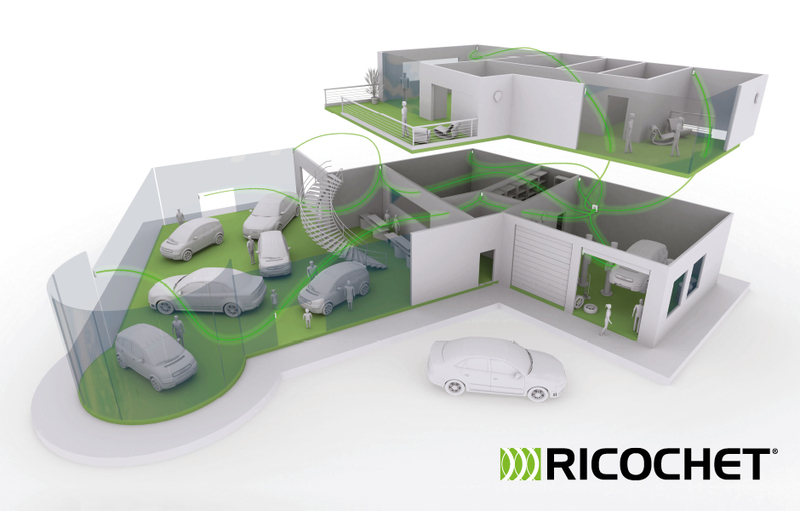 Ricochet is not a product – it is a wireless platform that encompasses many Texecom devices, including the Premier and Premier Elite range of control panels, detectors (including external, shock and smoke detectors), sounders, contacts and smart keys. Texecom also offers several wireless control panels equipped with Ricochet technology. Where hard-wired control panels are employed, then Ricochet can be added via expanders. This ensures that existing systems can also benefit from Ricochet’s flexibility. It’s a bit like a performance boost that enables advanced connectivity. Ricochet is also licensed by a number of other manufacturers, including GJD and Optex, allowing other specialised products to be added. Ricochet has many applications, both commercial and residential. In commercial environments, the mesh architecture increases coverage, while its self-healing properties provide the most reliable communication pathway available. Hundreds of devices can be accommodated, with each device acting as a repeater and remote diagnostics in real time. Increasingly available to a wider audience, Ricochet now also brings commercial-grade wireless signalling to residential applications. Simple to set up and quick to install, Ricochet automatically creates a mesh network with sophisticated signal encryption. While Ricochet may sound complex to install, the reality is very different. It’s really as simple as most radio-based systems, but includes a valuable tool that allows a visual assessment of the system’s performance characteristics. Adding expanders, if required, is a simple task, and ‘learning’ the devices to the system is also very easy. The engineer only needs to enter the mode to add devices, assign a zone number, press the ‘Learn’ button or short the ‘Learn’ pins and insert the device battery. The panel will confirm the process. Once the devices have been ‘learned’ on to the system, you can assess performance via the free Ricochet Monitor package. This software can be installed on any PC or laptop connected to a system expander, creating a visual representation of the system and communications paths. Installers who adopt the Ricochet platform will be rewarded with a solution that enhances the security and flexibility available when installing wireless systems.